Summer is the season for weddings, and that means that many people are working hard to finalize all of their vendors before the big day. There are many elements that go into making your wedding a memorable event, and if you’re looking for a way to ensure that your big day is a celebration for everyone involved, Party Trailers is here to help! We offer a variety of services to those in Missouri, Nebraska, Iowa, and Kansas, all conveniently packed away in our trailer. Whether you’re looking for event entertainment for your guests between the ceremony and the reception or you want to add another element to the party, you can rest assured knowing that Party Trailers has something for everyone. Check out the wedding packages we have available and give us a call to hire Party Trailers for your wedding! A wedding ceremony is a memorable event for the bride and groom, but the reception is where everyone gets to really celebrate the joining of two people. Depending on who you plan to invite to your reception, it may be difficult to find ways to ensure that everyone has a good time. 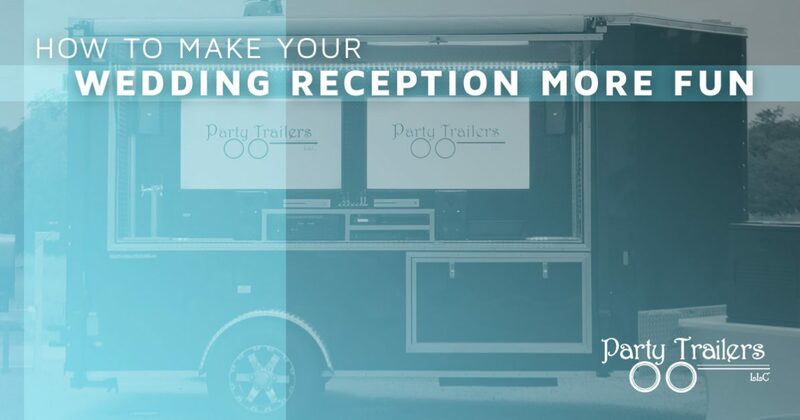 In today’s post, we will give you a few tips on how to make your reception an amazing event for all of your guests. Photobooths may seem like a clique wedding reception item, but they are a fun way to get everyone involved! Set up the photo booth in a corner of the room or outside of the main reception area. You have the option of hiring a professional photo booth company, or you can provide your guests with a backdrop and various props that they can use. Photo booths are a great asset for your wedding reception because they are fun for all ages, which is important if you plan on inviting grandparents, friends, cousins, and families that may have small children. Not to mention, if you choose to keep a copy of each photo that is taken in your photo booth, you will have an album full of delightful photos of your family and friends. Many people have come to expect wedding food to be the same assortment of chicken, fish, or steak, but if you want to mix things up, you may decide to incorporate an interactive food station into your meal. The best part about weddings is that you can make them whatever you want it to be, so if you really like macaroni and cheese, you could create a gourmet mac n’ cheese station where your guests can add all of their favorite toppings. Another option may be a build-your-own hot chocolate or cappuccino bar! Adding an interactive food station is a great way to add some unique flair to your reception that your guests will love. If you’re looking for a way to add a fun twist to your wedding reception, why not hire Party Trailers? Karaoke, VR headsets, and dual gaming systems are only the beginning of what Party Trailers brings to your event, and we can help you take your wedding reception to the next level! Whether you’re hosting an outdoor reception and you need another form of entertainment, you’re looking for a way to entertain your guests while you take your wedding photos, or something in between, you can count on us to make your wedding memorable. Contact us today to hire Party Trailers for your event today!